Coco: We have a great group of techs here but what would you say their most important task is? Dr. Kim: NOT TO LET THE DOCTOR GET BIT! They throw themselves in the line of fire sometimes to save us doctors and we really appreciate it! 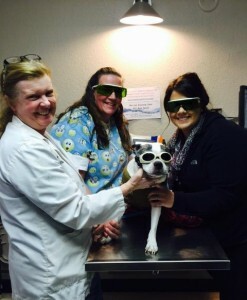 Dr. Fruitt: Being a liaison between the clients and the veterinarian. While we are doing the medicine they are communicating with the client about the treatments and plan we are following. Coco: What you guys don’t like being a chew toy for all animals, I can’t see why not! Being the go between is very important and communication is key! What do you appreciate most about them? Coco: Ok Dr Fruitt, who knew you were a Star Trek fan!? It does sound like a very important job that the techs have to both you and the clients. I bet working together so much all the time you have many funny stories about each other. Care to share any? Dr. Kim: Although we have had many times when we are laughing so hard we cry, to tell a specific funny story I just can’t do! There are just too many to recall the details about and are usually funny just in that moment. Dr. Fruitt: One of our techs who works with animal blood ALL THE TIME, will faint at the sight of her OWN blood! Coco: Well that narrows it down to one of three people that it can be, I will have fun investigating who does the fainting! Doesn’t she know that blood is just a big part of our lives as it is in animals, jeez! What do you wish people knew about techs and their job? Dr. Kim: That it can be a very stressful, mentally draining job! It is not playing with cute little animals all day long like most people think! It takes a very special person to be a technician, one who has a kind heart, loves animals and is patient. Dr. Fruitt: That it is an extremely demanding job! They have to very customer service oriented and be and excellent communicator. 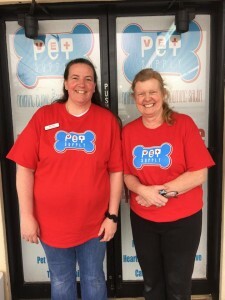 It is not just about being a “Pet Nurse” although that is the part they love the most! Coco: Who wouldn’t love to get to cuddle cute puppies and kittens all day long! Dr. Kim: We are very lucky to have a group that work well together and get along. They know when they can joke and when they need to be serious. 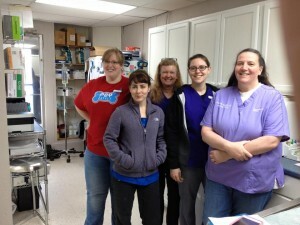 The entire group that works here including Pet-Vet Supply and Pet-Vet Grooming Salon all fit together well! I couldn’t agree more with you Dr. Kim! 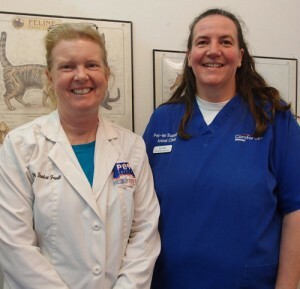 And Dr, Fruitt you are getting ready to celebrate your 5 year anniversary here at Pet-Vet! Thank you for all you guys do and thank you once more to our techs! Hope everyone has a great weekend!